Excellent quality clove, grown in Thailand to the highest quality specification. 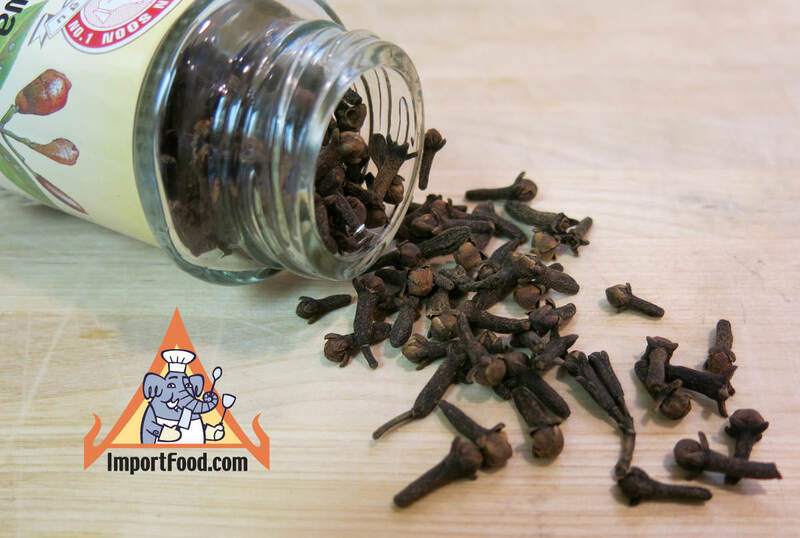 Clove is not usually used in Thai cooking however it's sold all over the world for a fairly high price. You won't find a better deal for excellent fresh cloves. Makes a nice pot pourri at home. Spekkuk bumbu is a rustic Indonesian spice cake that blends well with Thai food and uses spices that we import from Thailand, and we think you'll like this very much. Many cakes you find in Thailand are light and fluffy, and/or loaded with sugar, thus not similar to the typical American-style thick and heavy cake. Spekkuk bumbu is reminiscent of a western-style heavy cake, incorporating Asian spices. Delicious! Beef Renang is a dry-braised beef curry recipe that originated in West Sumatra, Indonesia, and it's made with a wide range of fresh and non-fresh spices that ImportFood.com specializes in so we thought it would be a nice addition to our Thai recipe collection. Cubes of beef cooked slowly in Asian spices, prepared slowly to yield pieces of beef loaded with flavor and cured almost like jerky. Compare this to Thai Sundried Beef, Neua Dad Deo. Serve with jasmine rice or crusty bread. This recipe is based on James Oseland's book "Cradle of Flavor".